Hooray! I'm all done (or close enough) with the guest bedroom! More photos to come. For the very observant, - yes, that paper lining the drawer is the very same lining the back of my bookshelves downstairs. Read all about that past project here. From what I can see, I love it! Looks fantastic! Looks great! As always though. Love it!! Looks very elegant. I'll have to come and stay :-) I've been to NY once and loved it. huh, all the "T's" are out - Tara, Tamstyles, Terri and Toni!!! It looks great! What an amazing transformation. It looks great! And thanks for the invite. I'll book my flight from California today! BOY IT LOOKS LIKE YOU'VE DONE AN INCREDIBLE JOB.  I'VE ALWAYS WANTED TO LIVE IN A BROWNSTONE, BUT DON'T KNOW IF I HAVE WHAT IT TAKES TO DO THE JOB YOU GUYS HAVE. Hi I just found your blog and love it. You have an adorable house. You've made me look at wallpaper in a whole new light. Love how the nightstand turned out! So you like my glasses? SO glad..I didnt know anthropologie sold anything like those...I will stamp it Mrs. Limestone approved! This room is so beautiful and soothing! Can you tell us what paint color you used? I'm looking for that exact shade to go with my new black bedroom furnishings. Thanks! Hi Aimee - you didn't leave your email address so I don't know how to reach you directly. The paint color in this room is called Saybrook Sage by Benjamine Moore. Hope that helps.